Did you know that 1/3 of the world’s amphibians species are about to become extinct and that 200 species have disappeared since the 80s? This rate of the amphibian extinction is scary and not normal. Usually, one species would only go extinct every 250 years! The rate of amphibian destruction has increased dramatically, and this is not good. Since frogs and other amphibians play a major role in our ecosystems, wildlife, and humans, if we don’t “Save The Frogs” our lives would be majorly affected. Frogs help balance our ecosystem. Tadpoles are very beneficial to the streams, and rivers that they are in. Since tadpoles constantly swim around, the water would be moving too. Because the water does not have a chance to become stagnant all the sediment, waste, etc. would also have to keep on moving. This helps the algae which is at the base of the food chain, to be productive and efficient. If the frogs weren’t there all the sediments would just be still, and all the debris would block the algae’s access to the sun, and it would not be able to photosynthesize properly, affecting the whole ecosystem. If frogs disappear, it would also affect our wildlife, since frogs play a big role in the food chain. Frogs eat insects that spread diseases like Malaria, and frogs’ eggs are food for birds and other animals. Also, snakes and other important reptiles eat frogs. So, if we were to lose frogs we would have a dramatic increase in insects, and diseases like dengue fever will increase and affect even more people. Also, we use frogs for medical reasons. Did you know that some frogs in Puerto Rico can produce and fix their own limbs? Scientists are studying these types of frogs in order to revolutionize the regenerative medicine industry. Also, in the 1980s there was a frog species called the gastric brooding frog, which was found in the Australian rain forests. The female frogs in this species could produce enzymes in there stomach that could treat the human ulcer. But, sadly this frog soon became extinct and we lost this valuable medical asset. Even though we have lost a lot of frogs over the past years there’s still time to make a change. We all need to start taking action now, and protect our environment. On April 27th, 2013, which was the 5th International Save The Frogs Day, I had the opportunity to interview Dr. Kerry Kriger, Ecologist and Founder of “Save the Frogs” non-profit organization, focused on amphibian conservation. This interview was broadcasted on May 21st, 2013 through Primary Perspective Radio show in Melbourne Australia. Pavan is a very passionate environmentalist, published author, the founder of Green Kids Now, Inc. non-profit organization, and the founder of Green Kids Conference. He is the official Biomimicry youth speaker, and a Global reporter for Primary Perspectives radio in Australia. 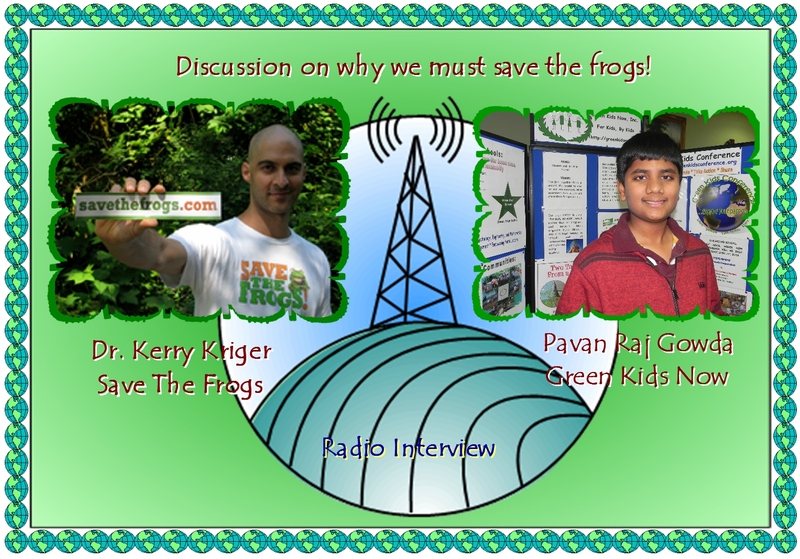 Global Reporter Pavan Gowda, Interviews Dr. Kerry Kriger, Ecologist and Founder of “Save The Frogs” non-profit organization.